ACE YOUR PSSA is Pennsylvania’s #1 elementary school assembly program that’s all about getting your students prepared and energized for their PSSA tests! This live production is perfect for all elementary grades taking the PSSA and it covers very specific PSSA test-taking strategies. It has been co-developed with educators who know this test thoroughly to get your students to maximize their potential. 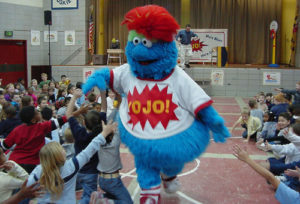 Our favorite fuzzy friend, YoJo, is initially very nervous and reluctant about taking his upcoming PSSA test. 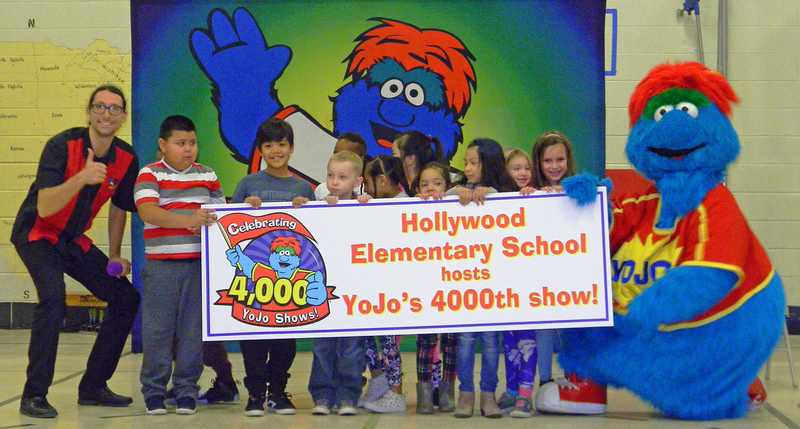 But with help from your students, YoJo agrees to participate in a series of PSSA game show challenges. These challenges demonstrate the PSSA experience with fun subject topics such as sports, music, pizza, etc. In the end, YoJo and your students learn the skills and gain the confidence to completely ace the PSSA! We cover important pre-test student preparations. Getting a good night’s sleep, eating a healthy breakfast, and showing up to school on time are emphasized to get your students ready, set and good to go! Important strategies for multiple choice questions and ‘open ended’ written items are demonstrated. YoJo and your students learn about using the process of elimination on tough multiple choice questions. We also illustrate why all ‘open ended’ responses should not only be clear and easily readable, but should also contain proof, evidence and detail. It’s the best in the school show business! Included is a whole van-load of oversized props, banners and custom audio & video equipment to make this a first class event. It’s only a minimal use of student class time. Only 45 – 50 minutes is required, and we guarantee this will be the most worthwhile use of your students’ time. It’s a wonderful comedic stress reliever. Let’s face it – prepping for standardized tests isn’t very enjoyable for either students or staff, but YoJo’s “hilariously educational” comedy does a great job tackling test in a fun and upbeat style. You get bonus materials materials, too. 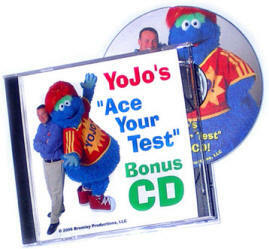 Your school will also receive a special CD, and all test taking classes will get color posters that review YoJo’s Top Ten PSSA testing tips. Need something for your K-2 group? Sure! 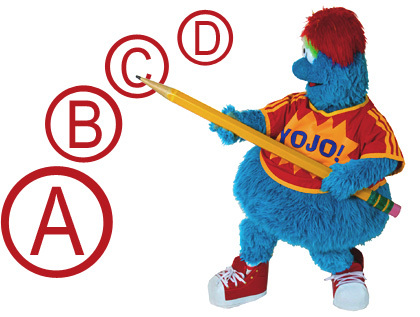 YoJo would love to perform a second assembly for your non testing grades. Our most popular K-2 add on assemblies are CHOOSE TO READ or TREAT YOUR BODY RIGHT. Sounds great! So, what’s next? Call Bromley Productions at 1-800-404-9656 to get a price quote and to discuss the most current availability. You can also send a ONLINE BOOKING REQUEST though our website.